Send a restorative eucalyptus treatment. Soothing and comfortable. 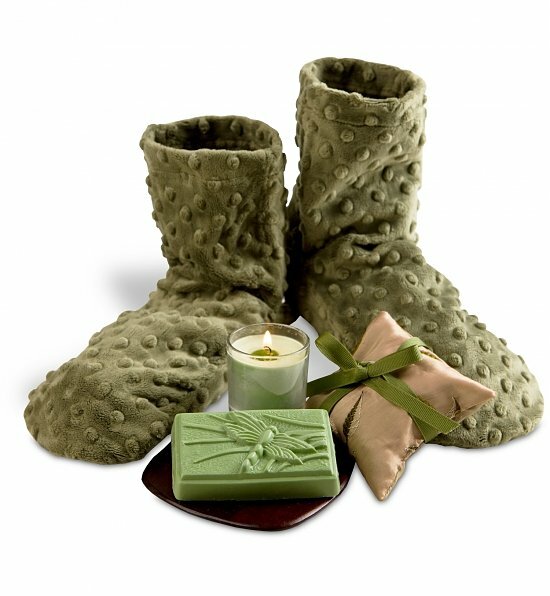 Silk and chenille velvet slippers with a microwaveable insert provide the user with a much needed escape. 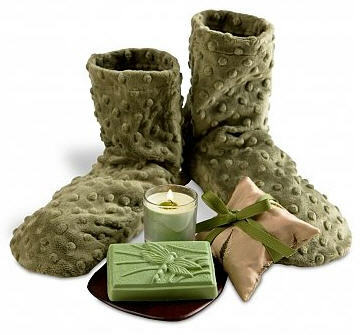 Sore, cold feet are soothed and warmed. Penetrating eucalyptus vapors and muscle-relaxing heat soothe achy muscles and relieve congested sinuses. Place inserts in the microwave or dryer for a moist, aromatic heat that increases circulation. For deep relaxation, we include an amenities bag of a Lavender Eucalyptus Sachet Pillow, Dragonfly Eucalyptus Soap, and a scented Eucalyptus Candle. The gift is exquisitely assembled with tulle and a hand tied satin ribbon. Removable inserts are filled with a combination of flax, eucalyptus, lavender and fiberfill. One sizes fits most.